In a few short years, ViscaBarca’s built up an enormous YouTube following in Germany and beyond. Focused largely around Call of Duty, he is known for funny but also competitive content. He proved that competitive edge during the Black Ops III season, showing his worth with amazing gameplay under the FAB Games organization in different stages of the Call of Duty: World League qualifiers. 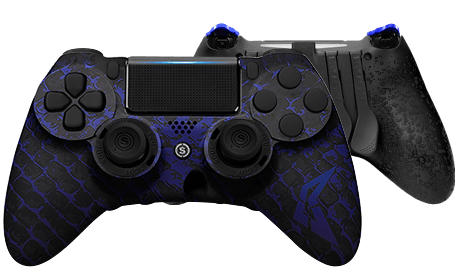 Sporting a dark, scale-covered design, the SCUF ViscaBarca offers a subtle, but unforgettable aesthetic. With deep indigo scales against a classic black soft touch, the ViscaBarca logo sets off this gorgeous tribute to one of Germany’s favorite YouTube and pro gamer personalities. 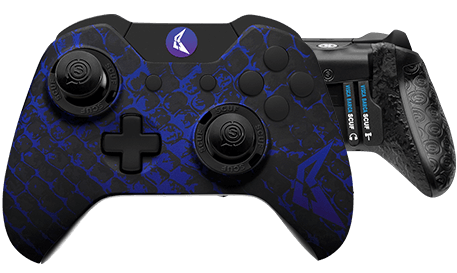 Pick up this sleek new design for the SCUF IMPACT or the SCUF Infinity1 today!